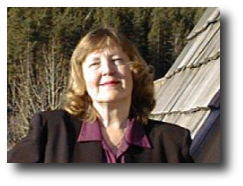 Diana Olson is a Certified Clinical Hypnotherapist and teacher of metaphysics. Born and raised in England, she emigrated to Canada in the early 1970s. Recalling childhood, she remembers submitting articles and stories for the Saturday 'Kids' Corner' of a national newspaper. At age eleven, the thrill of receiving a money order for one of her stories kindled the desire to become a newspaper reporter. "Without realizing it at the time, I believe this is what set the stage for my inner search or my inner journey and its subsequent record." She confesses, however, that she rose to the nonconformity challenge at age fourteen, by refusing to return to school. Following that statement, she adds quickly, the postponement of a formal education did not hamper her adventurous spirit; a rebellious streak saw her leaving home at age 18, bound for Australia, "all alone in the world and carrying just a few precious belongings neatly packed into a very small suitcase." Diana says she had to stretch her mind to the limits in order to accomplish her goals in those early adult years. "I did it by drawing upon a reservoir of inner strength and determination, and relying upon my intuition," she says. "But my opinions were always born of my own experience and not from something I'd read," she stresses. "Probably my whole life I have been one of those fools rushing in where wise men fear to tread, like the trusting fool in the tarot stepping off the edge of the world without the fear of falling." The downside, however, in those early days, was the belief that, everyone other than self had all the gifts and the talents to take them high on the ladder of success. Today, Diana and her husband travel 'quite a bit' but still do hypnotherapy on a referral basis. "Assisting others 'in absentia' using a surrogate format is one of our most effective tools," she says, "it really gets us to flex our psychic 'muscles' as we tune-in to the energy of the client's photograph." Referring to The Awakening Time poem and its startling delivery and interpretation after picking up a small quartz crystal, "I'm really interested to find out how many people made the 'promise and the vow," Diana enthuses. "Generally speaking, when reading the poem and its explanation, if the reader is really moved by the words and feels an inner pull in the solar plexus, he or she was present when the vow was made. It may even trigger a remembrance. I believe the whole thing was a group soul experience, and we will all be reunited 'through the book' or by telepathic acknowledgment."